The Jovian system, encompassing the giant planet Jupiter and its diverse collection of moons, is currently a popular target for robotic exploration in both NASA and European Space Agency plans. Jupiter itself is the largest planet in the solar system, with a maximum diameter 11 times that of Earth. Even though the planet could contain over 1300 Earths, its mass is only 318 times that of our world because Jupiter consists primarily of the light elements hydrogen (about 86 percent) and helium (about 14 percent). In the uppermost layers of the atmosphere these exist in a gaseous state, but deeper down the pressures are so high that they behave as fluids and solids. The colorful cloud bands circling the planet consist of various compounds of ammonia and hydrogen sulfide. Jupiter has four large moons, which are all very different and at least as interesting as any of the planets. Callisto has a densely cratered surface of dark, muddy ice that has probably remained virtually unchanged since the birth of the solar system. Ganymede is larger than our own moon, and even larger than the planet Mercury. It has mountains as tall and wide as those on Earth. Io is covered with layers of white, red, yellow, and black sulfuric material that erupts from active, but very cold, volcanoes. Icy Europa is perhaps the most intriguing of Jupiter's moons. Slightly smaller than our own moon, it is covered with a smooth icecap that completely envelops it. We now think that the ice is several kilometers thick, but it hides a vast water ocean below it. The gravity level around a planet is a function of the distance to the center of the planet; the further away, the lower it gets. That means that the side of a moon facing a planet is attracted slightly more strongly than the side facing away from it. As Io spins on its axis, it is distorted by Jupiter's tidal forces. This causes heating, which increases the temperature of the sulfur-rich rocks deep inside Io, leading to the release of sulfurous gases (it is a bit like heating up a ball of clay by kneading). The gases exit the moon through the volcanoes, spewing far into space. The gas often even escapes the relatively low gravity of Io, going into orbit and getting captured and charged by Jupiter's powerful magnetic field. These energetic gas particles are the main cause of the high levels of radiation around Jupiter. Just like the interior of Io, the interior of Europa must also be heated by Jupiter's tidal flexing, and is therefore probably liquid. That means Europa may harbor a giant water ocean, which might even contain some form of life. Callisto and Ganymede probably also contain water oceans, but Europa remains the most promising; unlike on its sister moons, its water is probably not sandwiched between ice layers but in direct contact with the rocky mantle, allowing life-supporting nutrients to leach directly into the ocean. All the ingredients for life, being liquid water, energy, and chemical building blocks such as carbon, oxygen, hydrogen, and nitrogen, may thus be available beneath Europa's icy cover. Jupiter has a very strong magnetic field. The unfortunate part about this is that it captures and electrically charges lots of particles ejected by its own moon Io and also from the Sun, which results in very high radiation levels. When the Pioneer 10 space probe made its closed approach to Jupiter in 1973, it had to endure some 500 times the amount of radiation that would be instantaneously deadly to humans. However, the giant planet's powerful magnetic field may also be an ideal place for electrodynamic tether applications. In both absolute and relative terms, Jupiter's magnetized ionosphere full of charged particles extends much deeper into space than Earth's ionosphere does. At our planet's geostationary altitude of 36,000 km (22,000 miles), electrodynamic tethers cannot be used due to the low plasma density. However, the ionospheric plasma at Jupiter's stationary orbit altitude of 88,500 km (55,000 miles, with respect to the top of the clouds) is still sufficiently dense to allow the application of electrodynamic drag and propulsion. Jupiter's magnetic field and therefore its ionosphere rotate together with the planet itself, locked as they are to the core of the planet. This means that at its stationary orbit altitude a satellite remains motionless with respect to the magnetized plasma and no electrodynamic force is produced. If a spacecraft with a conducting tether descends to a lower altitude, its orbital speed will increase and thus become higher than that of the plasma. Just like on Earth, the tether will then generate an electrical current and an electrodynamic drag force; power is generated at the expense of orbital energy and therefore altitude. Because the plasma is locked to the planet's magnetosphere and therefore the rotation of the planet itself, the further out it is, the faster it moves—just like how parts of a wheel are moving faster the closer to the rim they are. A satellite's speed, however, decreases when orbiting at a higher altitude. As a result, when a tether satellite circles the planet above the stationary orbit altitude, it will move slower than the plasma it flies through. The difference in speed between the satellite and the plasma will again result in power generation and hence an electrodynamic drag force, but this time that force acts in the same direction as the satellite's orbital speed. The "drag'' force is thus, in effect, a propulsive force for the satellite with respect to the planet itself. At Jupiter, a tether can thus generate power and increase its velocity at the same time. 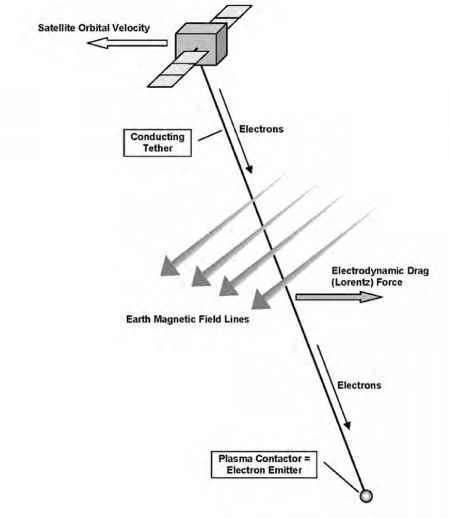 At Earth this is not possible because its ionosphere does not extend beyond geostationary orbit; electrodynamic propulsion is then only possible at lower altitudes, by generating a current in the right direction through the use of a power source like solar arrays or batteries (Fig. 5.14). The combined propulsion and power generation possible at Jupiter does not mean that energy is somehow obtained for free; there is no magic involved. The Lorentz force that propels the tether also acts on the plasma, pushing to slow down the ionospheric plasma and the rotating magnetosphere it is locked onto. Since this magnetic field is tied to the metallic core of Jupiter itself, the Lorentz force effectively slows down the planet's rotation. The energy that the tether satellite builds up in terms of velocity and electrical power is thus deducted from the rotational energy of Jupiter. However, since the mass and therefore rotational energy of the planet is so vast, the effect of the energy "drain" is completely negligible. 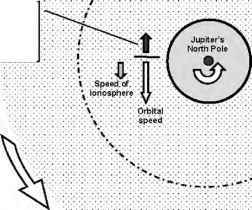 Figure 5.14: Whether the Lorentz force decelerates or speeds up an electrodynamic tether in orbit around Jupiter depends on whether it orbits below or above the stationary orbit. •-sj circular orbit (as explained in section Orbits in Chapter 1). Normally such orbital braking maneuvers are performed by rocket propulsion systems, at the expense of onboard propellant and thus mass to be carried along. At Mars aerobraking can be used, whereby a spacecraft makes short dips into the higher atmosphere to use the aerodynamic drag to slow down. However, at Jupiter the radiation levels close to the planet are extremely high and would damage sensitive onboard equipment if not protected by heavy shielding. In addition the properties of Jupiter's upper layers are not well known, so predictions of aerodynamic drag are inaccurate and could result in a spacecraft burning up rather than gently slowing down. At appropriate moments, by turning the tether on below the stationary orbit (resulting in electromagnetic drag) or above it (for electromagnetic thrust), the spacecraft's orbit altitude could be changed at will. This could help tune the orbit to those of the various moons, to enable more frequent visits than is currently possible using rocket propulsion and moon flyby maneuvers. It even may be possible to return a tether spacecraft with a captured sample of Jupiter's ionospheric plasma to Earth, by using electrodynamic thrust to increase the apoapsis altitude until escape velocity is reached. Using traditional rocket systems, such a probe would require lots of propellant, resulting in a very large, heavy, and therefore costly spacecraft.